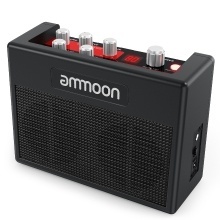 Highly portable and lightweight guitar amplifier specially designed for guitar players. With it, you can play your guitar anywhere and share the wonderful music with others freely. And the metal belt clip on the backside even allows you to play your music on the move. Equipped with dual 3" speakers inside, which delivers true tones and powerful sounds. Perfect for guitar practice, street performance, karaoke with friends, band performance, outdoors playing, etc. Features 80 drum rhythms to jam along with tap tempo; 4 DRIVE models( Clean/Overdrive/Distortion/Metal) provide a gain range for every musical style; 3 DSP effects (Chorus/Tremolo/Reverb) for you to create your own guitar tones; Built-in tuner to ensure you’re instrument is always in tune. Jamming along with your favorite tracks by simply plugging your MP3 player into the 1/8" AUX input and you instantly become part of the band; and you can also practice privately and silently with 1/8" headphone output jack. Dual power supply choices: DC 9V power adapter(included) or 6 * AA batteries(not included), suitable for indoor and outdoor usage, super convenient and flexible.